Special Containment Procedures: SCP-1093 is to be kept inside a sealed 5 meter by 5 meter containment cell. The cell is to be encased in a 30 centimeter thick lining of lead. Personnel are prohibited from entering the containment cell or making contact with SCP-1093 unless instructed by Level 4 personnel assigned to the object. No staff are permitted to enter SCP-1093's containment cell or make any contact with SCP-1093 without first being suited in the proper radiological protection. SCP-1093 is to remain deactivated unless the designated staff have instructed its activation. Description: SCP-1093 is a Caucasian male, 1.68 meters in height and between 30 and 35 years old. 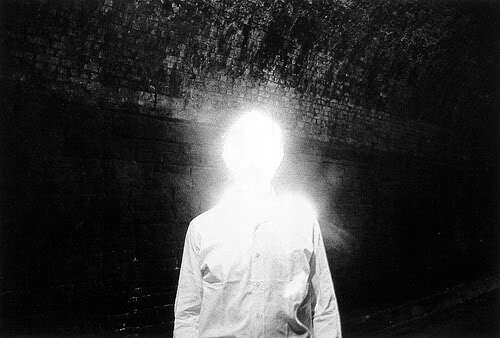 The head of SCP-1093 is composed entirely of a bright light, measuring approximately 1600 lumens. SCP-1093 has no physical cranium and there are no known sources for the light emitting from the head area of SCP-1093. The light at SCP-1093's head does not emanate any sort of heat. No causes for this abnormality have been determined. SCP-1093 is highly radioactive, emitting radiation levels ranging from 3500 rad to 4000 rad. It has not yet been determined what causes SCP-1093 to emit these lethal doses of radiation. SCP-1093 itself does not appear to be affected by this radiation, and it will constantly emit radiation regardless of whether or not it has been activated. On the back of SCP-1093, attached to the base of the neck, is a switch labeled with "On" and "Off", resembling that of a typical household light-switch. Light only emits from SCP-1093 when the switch is activated. When deactivated, SCP-1093 appears completely headless. When not activated through this switch, SCP-1093's upper body will remain limp. Upon activation, SCP-1093 will lift its upper body, standing stiff and motionless until deactivation. Biological examination of SCP-1093 has shown it to be, externally, a living and healthy human from the neck down. SCP-1093 displays a stable heartbeat and steady, constant breathing. How SCP-1093 is capable of respiration is unknown, as there are no visible openings to allow any form of inhalation or exhalation. SCP-1093 does not appear to require food, drink, or sleep. All bodily functions immediately cease upon deactivation. For information regarding the internal anatomy of SCP-1093 refer to Surgical Report F224B-1093. When activated, SCP-1093 is entirely dormant. SCP-1093 does not respond to any staff attempts at interaction and is completely unresponsive to all external stimuli. In this state, SCP-1093 does not appear capable of speech and does not display any evidence of sapience. Under these conditions, SCP-1093 will continually stay stationary, locked into a single stiff, upright position, until deactivation. Personnel who have been within the immediate proximity of SCP-1093 have reported experiencing auditory hallucinations that promptly desist upon exiting the chamber. Extended contact with SCP-1093 appears to cause these hallucinations to persist for longer periods of time, typically spanning several days before abruptly ceasing. In a number of cases the sounds have continued for excessive spans of time, which has caused significant distress in the afflicted personnel, though the eventual sudden desistance has remained in nearly all cases. The most commonly experienced sounds produced by SCP-1093 include a high pitched ringing, a loud "drilling" sound, and a low pulsation similar to that of a heartbeat. These auditory anomalies all appear to occur exclusively when SCP-1093 is activated and all seem to emanate from an indiscernible source. SCP-1093 remained deactivated during the length of the surgery. As of the writing of this report, no internal observation on SCP-1093 has been performed while it is in its active state. Radiological protection was worn by all personnel engaged in the operation. Upon the first abdominal incision, when piercing the dermis of the specimen, all agents in the immediate area reported a sudden, high-pitched ringing emanating from an indiscernible source. The ringing continued until the incision was completed and the abdomen of the specimen was fully opened. This ringing process repeated for each subsequent incision made upon the subject. Once the internals were exposed, no organs or skeletal structures could be located. The entire interior of SCP-1093 appears to consist solely of a pale white opalescent substance. The material has a gelatinous consistency and is filled with many branching, red and blue vein-like protrusions. It seems to be very durable and resistant to damage, as none of the tools used during the surgery were capable of piercing or scratching it. This substance remains unidentified and no samples were able to be extracted for testing. One abnormality of note is that, when handling the exterior portions of SCP-1093's body, all agents could physically feel internal, bone-like structures. The ribcage of SCP-1093 is visible when viewed externally, but no skeleton appears to be present within the interior of SCP-1093. In addition, prior tests have indicated the presence of several functioning internal organs within SCP-1093, but none could be identified during the length of the examination. Further investigation of this matter is requested. All incisions made upon the specimen healed at a normal rate over the course of several months subsequent to the surgery with the expected scarring.